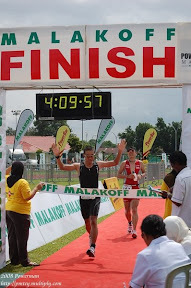 Or this is commonly known in Brunei as Miri Triathlon because it is being held in Miri. The event will be held on Saturday,28th November 2009 for Sprint Triahtlon and on Sunday, 29th November 2009 for the Olympic Distance. From the above list only 9 Brunei triathlete registered for this event and unfortunately Zaeidi and me have to withdrawn from the event due to personal reasons. Some of them registered for both events Sprint & Olympic Distance since the events are being held on separate days. Sprint event on Saturday afternoon and Olympic distance on Sunday morning. Last year 2008, I did registered for it but cancelled it due to PSK being held. This year again, cancelled. Hopefully next year I’ll be able to compete in Miri. Good Luck to you all and Brunei Yakin…………………………….